The Company’s land base represents one of the largest undeveloped land bases in Western Canada, with exposure to conventional and unconventional resource, all natural gas and all crude oil play types including, the Montney, Deep Basin and Pelican Lake. 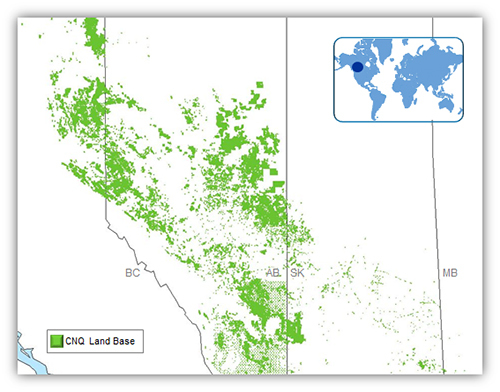 Canadian Natural has developed expertise in mature-basin exploitation, from years of experience in developing Canadian light crude oil, conventional natural gas, and primary heavy crude oil. The Company has widened its core competencies for developing its non-conventional assets like the Horizon and AOSP Oil Sands mining projects, thermal in situ oil sands, and unconventional natural gas properties like the Montney and Deep Basin.